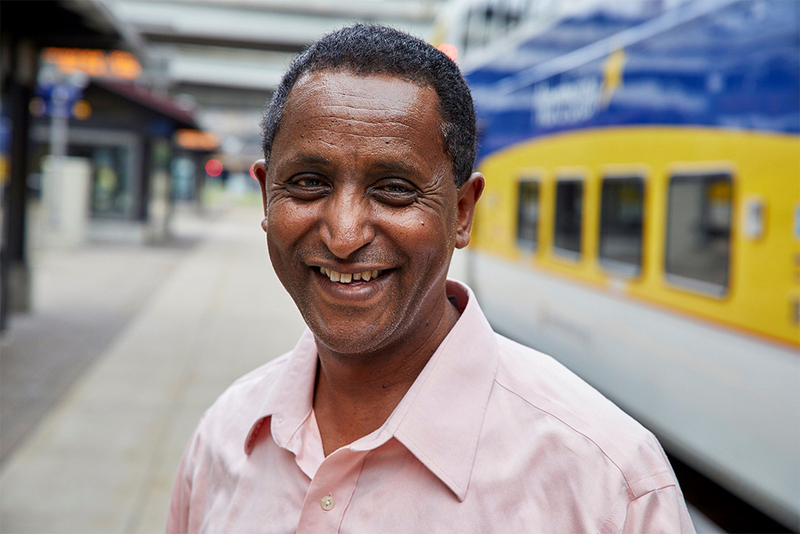 How did you come to work at Metro Transit and what do you do? I started as a bus operator in 2008, which helped me understand where and how our service is delivered. Today, I bring that knowledge to my position as a Senior Account Specialist in Sales Operations. In my current role, I help plan, organize and oversee programs for pre-paid transit fares and special event ticket selling operations. Where are you from originally? Tell us a little bit about your background. I’m originally from Ethiopia. On three separate occasions, I was captured and intimidated to join the government’s communist party. Facing torture, imprisonment and the threat of death, I fled to Addis, the capital of Ethiopia. When I got to Addis, I was imprisoned again. One of the prison officials knew my oldest brother, and I was released after three days. A year later, I was given an ultimatum: join the party or face the consequences. I decided to flee the country, walking for several days to the neighboring country of Sudan. After crossing the border, I was taken into a refugee camp and later moved to Khartoum the capital city of Sudan where I joined Doctors Without Borders as an accountant. Two years later, the Sudanese government shot down the plane carrying one of our head administrators. The organization withdraw from Sudan and I had to find a new job. My next job was with an American organization called Lutheran World Service. A year later the U.S. government granted me asylum and I arrived in the United States in July of 1991 and became a U.S. citizen in 1997. Creating an enjoyable workplace collaborating with co-workers, staying positive and fulfilling customer needs. It’s rewarding when we can help not only our customers, but each other in the office. What are your favorite activities when you’re “Off the Clock”? I haven’t forgotten those who are still in Ethiopia. As a founder and board chairman of a non-profit, I help orphaned or abandoned children in Nekemte, Ethiopia, by providing shelter, food, clothing, basic medical care, spiritual education and training. I returned earlier this year and look forward growing this service in the future. We are currently expanding and renting a second home. We would eventually like to have a community center and school that serves the children. Learn more about the Resurrection Orphanage & Center of Nekemte on Facebook.